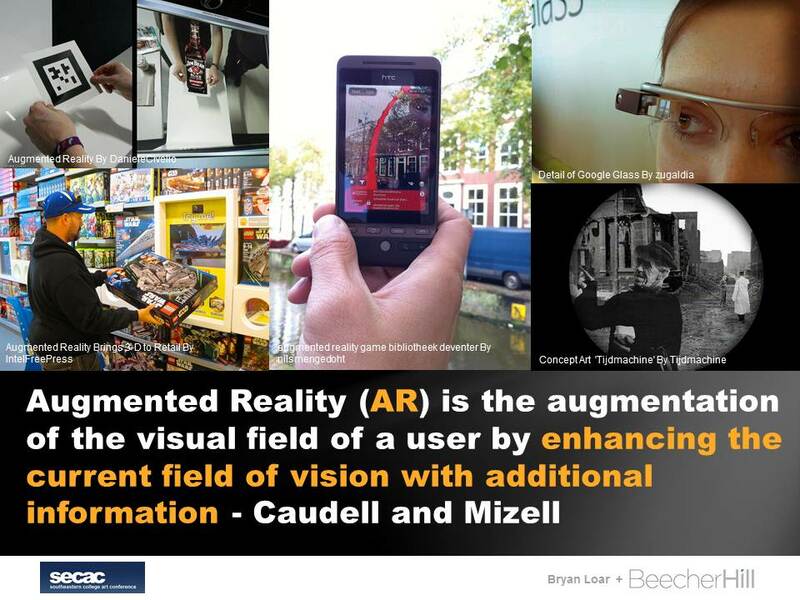 Image: Slide from Upcoming Presentation on Augmented Reality. I am very excited to be part of the upcoming session "When the Past Collides with the Present: Moving Beyond the Single Classroom Experience via Digital Technologies" at the Southeastern College Art Conference (SECAC) 2012. My presentation focuses on augmented reality (AR) and how AR can enhance the educational experience. Below is my abstract. Augmented reality contextualizes and gives deeper meaning to real-world objects, and it provides educators with a means to extend the classroom beyond traditional confines. The technology uses mobile devices, head-mounted displays, or eyewear to produce an informational layer between the viewer and the viewed. Unlike virtual reality, a completely simulated experience, augmented reality overlays virtual information over the real world. Architecture, sculpture, and the visual arts in situ can be complemented with a rich layer of data. Consequently, living labs may be constructed that enhance the educational experience and student engagement. This paper explores current case studies, suggests practical applications, and speculates on the future of education-based augmented reality. For more information on SECAC, please visit www.secollegeart.org.